The versatility of the Lumintop TD16 High Power Tactical Flashlight make it not just ideal for weapons and guns but primarily in homes, outdoors and other places when you are suddenly caught in a total darkness. It is not only reliable, weatherproof, with variable mode selection, tough materials, spring-loaded and could beam almost half a kilometer of brightness, but it could also be used anywhere and anytime. Check Price At Amazon.com Read Customer Reviews At Amazon.com! Tactical flashlight is becoming a necessity nowadays. Where weather is becoming more and more unpredictable, this artificial lighting is the best alternative, or shall we say, better than ordinary flashlight because of its reliability, availability, durability compared to conventional ones and versatility. The Lumintop TD16 High Power Tactical Flashlight is one of the best examples of a superior product that could address the changing times. You really need some illumination from a flashlight (also called “torch” outside North America) when the need arises. It is also true when even you are at home and suddenly there is a need for a flashlight at night when the power from the grid went out or your dog is loss in the woods in the dead of night. Tactical flashlights are primarily designed for installation mainly on weapons, but its popularity makes it conducive to an everyday use outdoors or in homes. Find why you must have a tactical flashlight rather than an ordinary one with this information about the Lumintop TD16, probably the best choice there is. 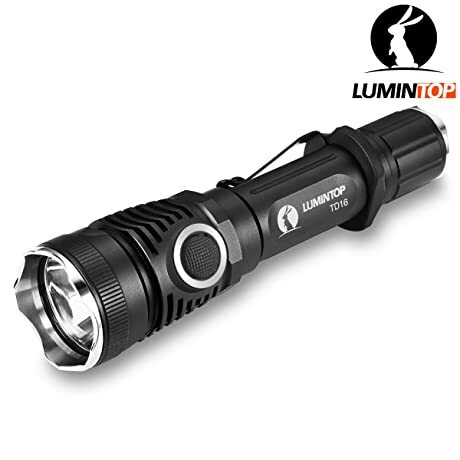 The Lumintop TD16 Tactical Flashlight is a LED-power flashlight enhancing 1000 lumens (unit of illumination) of brightness while its beam can reach a distance of 310 meters (effective range). It uses the premium CREE XM-L2 (U2) LED type of bulb. Due to popular demand from consumers, this bulb is replaceable by the CREE XP-L Hi (450 meters effective range of light) which could be used in a total pitch black situation, in night searches and any other similar situations. The reflector of this light is so precise because it has a double-side AR (Anti-reflective) coating on the lens that make more light pass through the lens in contradiction with reflecting back the lights toward the source. The light from the source is magnified almost 99%, leaving only 1% of loss. This light operates in dual-click system with 6-mode selections practically useful in outdoors, home and everyday use. The modes are as follows: Low-Mid-High-Strobe-Flash-Slow Flash. The tail switch is used to power and shut-off (ON and OFF) the torch and tap for momentary-on tactical function. The big side switch is for selecting the right mode for the situation. This tactical flashlight could be used even under heavy rain without malfunctioning. The flashlight could remain submerge in water (2 meters deep) for about 20 minutes, in case you tripped yourself in a pool of water or fell in your bathtub, and can still function. This is made possible by the durable rubber O-ring mounted in-between segments. The torch’s tube is made from aircraft-grade aluminum, anti-scratch and military grade finished in hard-anodized manner. The tube could be easily gripped even with wet hands (due to sweat, moisture and other reasons) and even with too dry palm. It is basically a non-slip grip even in the harshest conditions. The head and tail bezels are made from sturdy stainless steel, a metal that does not corrode. The tail bezel is detachable where batteries are inserted. Both bezels are tough and shock-proof where they are shaped and can be used as a weapon when the situation calls for it. This flashlight uses a single 18650 type lithium-ion battery or 2 pieces of the CR123A type batteries. The dual capability to use different kinds of battery is unique to this brand and could rarely found among other brand of the same class of torch. The Lumintop TD16 has the following dimensions: 6 X 1.5 x 1.5 inches (that’s length, diameter of tube and tail end diameter, respectively) and only weighs 5.6 ounces, so light and so small, it could fit in the palm of your hand. The lightness and sleekness of this light makes it easy to store, hand carried or put in your pocket. The torch can be placed upright in a flat surface and could be used as a “candle” if you forget to buy some. This position is secured and it will not fall as long as the surface is flat and does not flip over. With memory on mode: The torch could remember your last mode you used, except for the strobe. This way, you don’t have to undergo mode selection if you still want to use the last mode you used previously. With dual-spring: The dual-spring mechanism inside the head bezel housing can protect the flashlight against shock from fall, anti-reverse polarity and vibrations. Several accessories could be mounted or installed: Using the TD16, there are other devices that could be installed if it deemed necessary such as a multi-function remote switch. The light could also be mounted on weapons (perfect for night hunting) and as color filters for guns. And all that are available from Lumintop and its dealers, just place an order separately. Long run time: The battery could last more than 40 hours in low-light mode, unlike other brands which are commonly pegged at half the time. Batteries not included in the package: There are no batteries that come with the package, they are sold separately. To respond to the demanding call of tactical duties, emergencies and other unexpected events in pitch black environment, a really good and reliable light is what you need. That is when the Lumintop TD16 High Power Tactical Flashlight comes to the rescue. Although designed for military, police and other law enforcement uses of yesteryear, this tactical flashlight is now available to civilians and individuals, especially those who want protection and emergency lights when everything turned dark. The salient features this product offer are really worth every penny.